Iain Dale's Diary: Was THAT Poster a Success? Stratford Conservative has written a blogpost questioning whether this poster has backfired on the Conservatives. He thinks not. I tend to agree. Any poster which is still being talked about two weeks after it first appeared has to have something going for it. Cameron dealt with the airbrushing issue with good humour and I think the fact that it has generated 74,000 new versions rather speaks for itself. I think my only question about the poster is why did every poster say the same thing? OK, you get uniformity of message, but if there had been five or six slogans I don't think the main message would have been diluted. But then again, what do I know? "Adverts that feature heavily retouched images of perfect skin, perfect hair and perfect figures mean that VOTERS increasingly feel that nothing less than perfect will do. Advertisers should be honest and upfront about the extent of airbrushing that goes on. It is frankly dishonest to advertise an anti-wrinkle cream and then airbrush out all of the wrinkles in the ad. And it is simply irresponsible to take already underweight POLITICIANS and then slice off pieces of their thighs or hips in the computer suite. Consumers should have as much information as possible and VOTERS should have the space to develop their self-esteem without constantly being bombarded with a narrow range of manipulated images that promote conformity." I live in a Labour held marginal. There are hardly any large billboards in the constituency, so I question the value of a campaign that will be invisible to most of the voters here. My wife said it sounded false - what will he cut?? Is Yes and No an answer? Yes its every where and I do know alot of people have seen them and the message is noce and clear. I think the Torys do now look very good on the NHS, no longer can Labour be the party of the NHS. ... and that's being laughed at. People are still talking about Hitler, and are subject to never-ending versions of the Downfall video, even though the last time he presented himself for election was more than 60 years ago. I would not, however, see a reincarnated Fuhrer polling well. 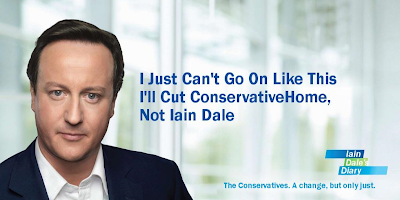 If you really think that this advertisement has done any good for the Conservative Party you need a reality check. I trust those in Central Office have learned their lesson. People say there's no such thing as bad publcity, but the "Demon Eyes" posters did the Tories no good at all even though they were much talked about about. I think in reality this poster will soon be forgotten. And just as well. The commitment to the NHS may be politically wise, but is bad for the country. I don't accept there's no waste to be cut and I can't justify leaving the NHS budget pristeen while cutting the budget for our amed forces who are clearly in deadly danger every day. It is indeed still being talked about - it is being mocked and Mr Cameron with it. Airbrushed or not it has done the Tory party no good at all! @unsworth - did jo swinson claim cosmetics on her MP expenses? I don't think so. Hey, there's nothing wrong with being well groomed - but DC looks like he is promoting botox in that ad!! His PR team need to get a grip. @unsworth - too funny!! I really can't bear most politicians these days. Unreal. It was successful if the goal was to make Cameron look like a botoxed camel who's just caught sight of the Grim Reaper. That you can't bear most of them these days is interesting. I never could bear any of them, ever. As to Botox, what about Brown's interesting makeup disasters? Remember the orange patch? Still at least Cameron doesn't chew his nails and pick his nose - in public, anyway - and he seems to know how to get dressed as well. Brown always looks to me as if he'd been forced into his clothes, probably with aid of cranes, jacks, levers and other mechanical devices. As I've said elsewhere, I simply cannot understand how any individual can so ruin Savile Row's finest efforts. It's an art, obviously. No - being spoken negatively about two weeks after it's launch is not a success.